I am pleased to inform you that the accreditation for Northwest Vista College (NVC) has been reaffirmed by the Southern Association of Colleges and Schools Commission on Colleges (SACSCOC). Every 10 years, NVC must go through a rigorous reaffirmation of accreditation process to ensure academic quality and compliance with federal regulations. As an accredited college, NVC can participate in federal and state financial aid and enable students to have their credits transfer to other colleges and universities. This positive outcome is the work of NVC’s faculty and staff who are committed to our student success. I also want to thank our students for their continued support and dedication to their education. You are the reason for the college’s success. 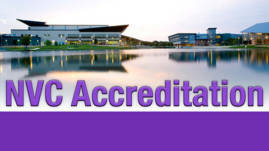 For more information on the reaffirmation of NVC’s accreditation, click here .